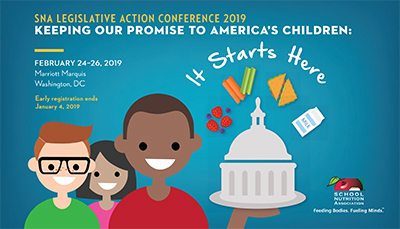 #LAC19 is your best opportunity to learn firsthand how the results of the mid-term 2018 election will impact your programs, as well as meet face-to-face with lawmakers to educate them about the importance of school meals. At this premier gathering, you’ll hear from Washington insiders and compelling keynote speakers, including presidential and political historian Doris Kearns Goodwin. It Starts Here: Charge to the Hill! Your legislative representatives care what you think. Share your passion, expertise and stories when you visit personally with Federal lawmakers during LAC’s annual “Charge to the Hill!" View the LAC promotion piece for a preview of the 2019 conference!